Puli Aval Upma| Tarmarind poha is a variation to the poha upma which is a quick breakfast fix, that could be made in a jiffy. Poha always comes handy for breakfast as it soaks up within seconds. 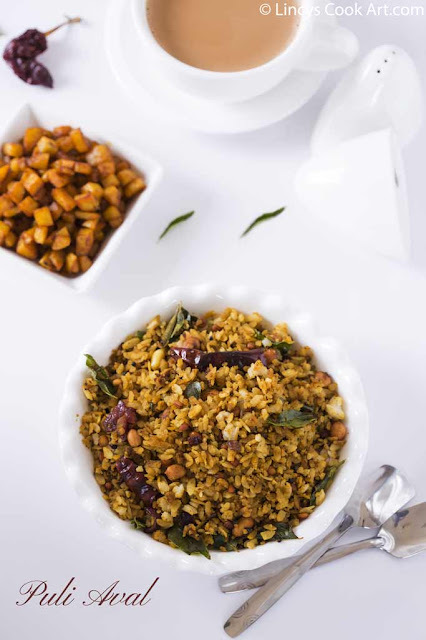 I have already shared a variation of Lemon poha earlier in blog, I have also shared a sweet using poha i.e. aval ladoo and also a snack item Poha chivda. Winter season always puts me in a sleepy mood especially in the mornings and I really hate to wake up. These days simple quick recipes comes handy. Tamarind with the spices gives warmth and provides a feelgood factor in the mornings. I have prepared this recipe at the time of Vinayaka chaturthi but could not post the recipe. I again prepared this dish recently and thought it was the right time to post the recipe. Soak the tamarind in 1/2 cup of water and extract the juice. Now add the turmeric powder, chilli powder, coriander powder and salt with this and mix well and set aside. Heat oil in a pan and add mustard seeds, jeera. Once the mustard seeds splutters add the chana dal, urad dal and peanuts. Allow the dal to become golden and the peanuts gets roasted. Now add the broken dry red chillies and reduce the flame; add the hing. Now add the chopped onion, green chillies, garlic and curry leaves; cook in that oil till the onion turns translucent. Now add the tamarind juice with all the masala; allow to cook till the raw flavour of the tamarind leaves and the water content almost evaporates like a thick gravy. Add the soaked poha and mix well. Check for salt and add if required. 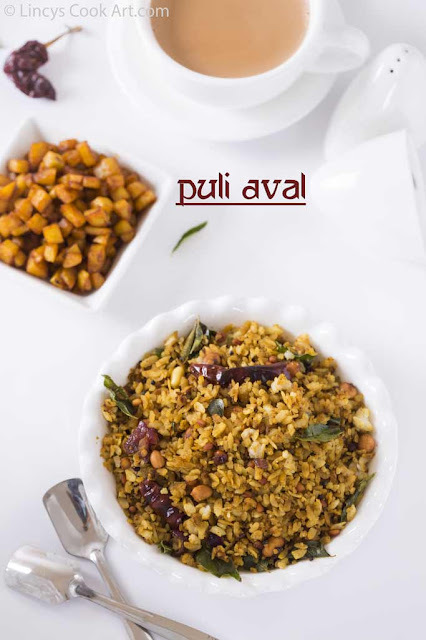 This is one of my favourite ways to make poha. Lools delicious.